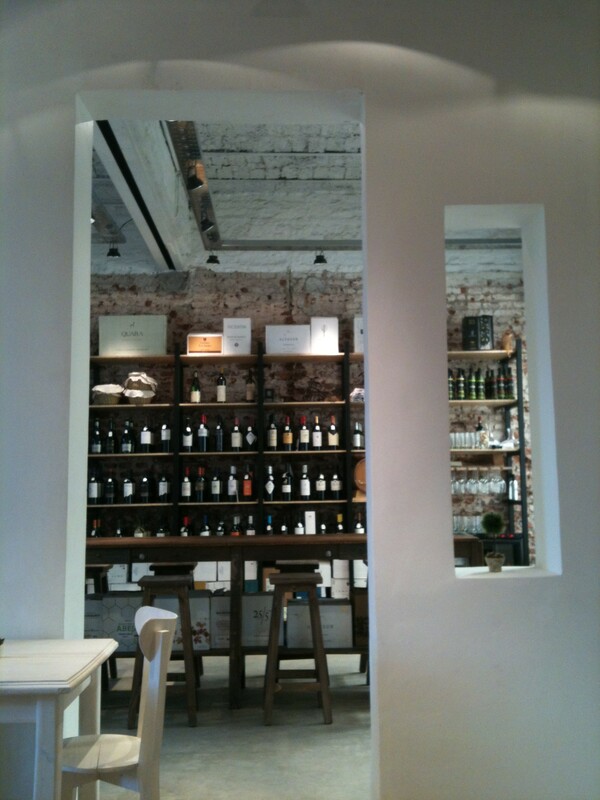 Where to sip wine in Buenos Aires: Pain & Vin, Palermo Soho. If, like me, your winter holiday involved travelling to somewhere just as cold and grey as BA, it’s safe to say you’re back and increasingly grumpy about the prolonged misery that is the weather. Ordering in dinner remains a top winter activity – let someone else deal with the crappy weather on their crappy little electric bicycle, ‘cause frankly it’s worth paying the tip. But this nippy season has seen some new ventures bravely take on the economic climate, the weather, the mid-terms, hell everything, and these two spots are worth making the effort for. Astor (On Sunday, August 11, 2013) opened in Colegiales two weeks, a modern spin on bistro fare, with top chef Antonio Soriano at the helm. But the second opening, the elegant Pain et Vin vinoteca, has an edge over other wine stores: its owners built wood-burning oven that is fuelled each day to bake the store’s crusty delights – banishing soggy, crustless miga to the history books forever – I hope. Run by sommelier Eleonora Jezzi and her Israeli partner Ohad, P&V is a master stroke in terms of selling high-end wine. The usual suspects adorn the not overly packed shelves – Altos Las Hormigas, Domaine Bousquet to name a few Mendoza faves – but thanks to Ohad’s sharp baking skills, winos and wannabe oenophiles will happily keep on a-sipping if the still-warm bread and olive oil keep a-flowing. For an educative insertion, book into one of their organized tastings. Mr Links and I headed to the debut affair hosted by Bodega del Desierto, whose Cabernet Franc I like to rave on about now and then. I’ve never sampled other wares by the La Pampa-based winery, so it was a real treat to dip into Pinot Noir, Syrah, Malbec and a sparkler, backed up a supporting team of delicious bread, baked in the wood oven (logs outside and in, lined up and waiting their burn turn) to dip into oil as well as cheese and ham. Tasting glasses are in fact regular size, “for a proper measure,” according to Eleonora, and perched on a stool around the communal table meant the chat flowed, the wine flowed and the experience was convivial. The bottles were dead by close. Other tastings have since taken place, led by star somm and wine writer Joaquín Hidalgo, and have included Clos de los Siete among others. These guys know their stuff, and are well connected. Depending on your mood, choose from four spaces to sip and tuck: the tasting zone, outside at the banquette and cream tables adorned with tiny cacti in front of the kitchen or on a stool in the front window – why not take a starring role, glass in hand, and become the envy of passers-by.The space is light and airy thanks to the white walls; the back patio, although currently a bit sparse, has the makings of a great little outdoor sipping space, while original terracotta-colour brick work peeks through behind the wine-laden shelves in the tasting area. After that initial tasting, I vowed to return for a sandwich and to really check out the dough. And return I did, on Wednesday. The second part to this wine store is its café. The menu is short and sweet, bistro-style sandwiches of course, although cold cut platters are available for one, or for two share. The plan was to dive into a Serrano-style ham, basil and tomato sarnie (25 pesos), however, the lure of a BLT was too much to turn down. Ordering from in-house sommelier Mariano, I was also almost tempted into a cheeky lunchtime splash of grape juice (between 24 and 42 pesos a glass) although self-control got the better of me as school loomed later in the day. And so a thick piece and a thinner piece of bacon came 15 minutes later slapped into two slices of rustic country bread. The L and T were nice and fresh, and there was lashings of a delicious rosemary mayo that enhanced flavours with a tangy touch. Although I’d consider a pan de campo to be white and soft with a crusty, er, crust, Ohad’s loaf is rather more wholemeal looking, certainly has larger air pockets than other more common bread and has an element of sourdough chewiness to it. But fresh and tasty it was, with a slight olive taste. The ingredients really packed this BLT, no skimping on the porky slices, although next time I’d ask for it to be “really, really crispy” just to really close the deal. Pain & Vin not only serves up simple yet tasty sandwiches on chunky hunky bread you’d want pass off as your own work to your mother, but you can also sample or purchase wine, grab a coffee to go, or snap up a farmhouse, olive, nut or rye loaf (one kilo loaf from 24 pesos). In fact, let’s take this hate campaign a step further. CFK, if you make pan de miga illegal, you’ve got my vote.